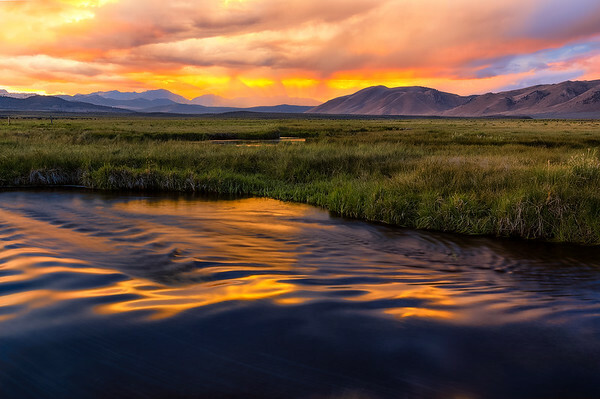 Well known for the large and plentiful trout that swim through the Owens River, fishing isn't the only lure for this beautiful area. I had promised myself at least one day of lounging around camp for this vacation and had spent it reading, walking the dogs, and napping in the hammock while thunderstorms surrounded the valley. I didn't even mind the occasional sprinkles that woke me from my respite as the air was warm and a good breeze was going most of the day. When my friend, Marc had returned from his wanderings we took the time to enjoy dinner in camp without a clear plan for shooting the sunset. Still feeling the serenity of having spent the day at ease, we decided to drive over to an area of the Owens River, easy to get to and not far from camp. We had barely started checking out possible compositions when this lovely scene presented itself. I almost felt guilty not having worked hard to accomplish anything that day as all I had to do was walk up to the river, set up my gear, start shooting, and add another beautiful landscape to my portfolio. I guess I can say that we pay for these rewards in other areas of our lives and it all evens out in the end, but I remember standing with my camera, a little smile on my face, feeling grateful and content at the end of this very fine day.